Robert was born in 1882 to Henry (1837 – 26/01/1898) and Jane Carden (nee Ward 1848 – 02/11/1931). His parents were married in Portsea Island, Hampshire on 25th December 1866. Rose b.1870. Married Harry Haynes in Southampton in 1898 and after his death in 1902 married John Henry Austin in 1908. Harry b.1873 – d.22.04.1900. Married Jane Read in Southampton in 1898. Minnie b.1876 – d.07.08.1930. Married John Farrell in Southampton in 1898. Albert b.1879 – d.1905. Married Charlotte Louise Wilkinson in Portsmouth in 1904. On the 1881 Census the family is living at 19 High West Street, Dorchester and Robert’s father is working as a Carpenter. By the 1891 Census Robert and his family are living at The Alfred Arms, 82 Northam Road, Southampton and his father is now a Publican. The Alfred Arms was a beerhouse and in 1959 it was granted a full licence. It closed on 3rd April 1982. In 1898 Robert’s father is running The Criterion public house and Harry Haynes is running the Turks Head, 1 West Street, Southampton. The 1901 Census shows that Robert is working as a Carpenter and Joiner. He is living at The Criterion, 69 St Mary’s Road, Southampton with his brothers George and Albert. This pub is run by their sister Rose and her husband Harry Haynes. Robert’s brother Frederick is living at 14 Northam Road, Southampton with his mother and sister Minnie. Frederick is working as a beer retailer. Robert married Maud Ethel Parker (1888 – 1914) in Southampton in 1910. On the 1911 Census Robert is living with his wife and son, Robert William aged 2 months, at 7 Belvidere Road, Southampton. He is working as a Licensed Victualler at a Beer House, on ‘His own Account’. Maud is assisting in the business. Robert’s mother, Jane, is living at 14 Northam Road, Southampton and is working as Beer House Keeper, on ‘Her Own Account’. Also living here is her son George and a servant working as a Pot Boy. Robert enlisted in Salisbury as a Private into the 13th (Works) Battalion of the Devonshire Regiment. This Battalion was formed in Saltash in June 1916 and in April 1917 moved to Plymouth. The Battalion remained in the UK. 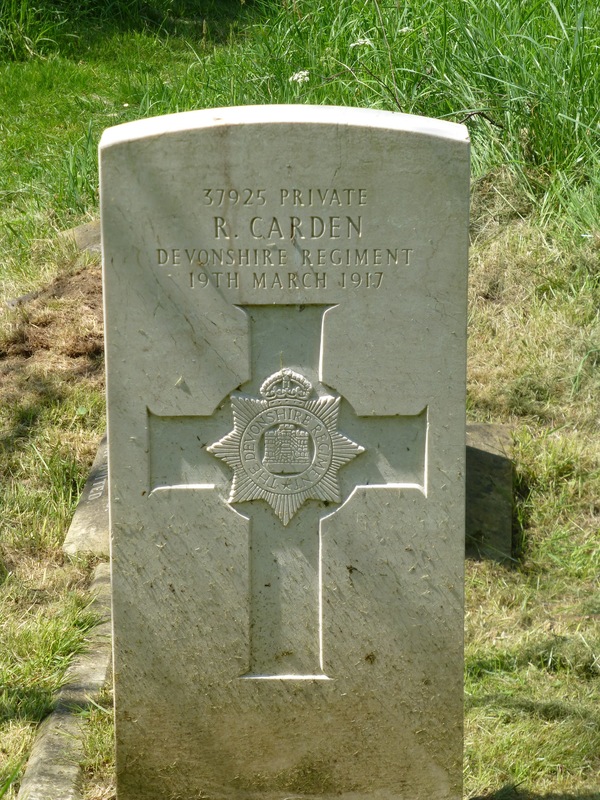 Robert died in Salisbury on 19th March 1917. He was awarded the British War and Victory Medals. He is buried in Southampton Old Cemetery. Grave Reference 185 D. 121.